My new book To Kiss Or Not To Kiss - OUT NOW on Amazon and Kindle. Tonight I’m having a soft launch with friends at The Canonbury Tavern in Islington and I can’t wait to relax, forget about what isn’t done, and mark this milestone in my life with a fitting celebration. I may well have another launch, for the media, after I lock down a bookshop distribution deal. But today is the important day for me personally. So thank you to all my blog readers and future book readers, and to all the family and friends who have supported me to get to this moment. I really hope you enjoy my short stories – some romance in bite-sized pieces. 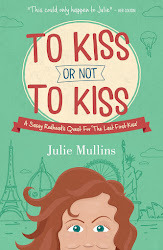 It is the story of: a sassy redhead’s quest for ‘the last first kiss’. I’m touched that 30 YEARS OF NEIGHBOURS have posted an interview with me today, to happily coincide with my book launch. So this blog post is simply to say: here it is. Read and enjoy!